The Jay Easy Fluid Lightweight Wheelchair Cushion. 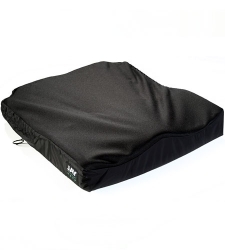 Lightweight while providing a high comfort and stability level; the Jay Easy Fluid wheelchair cushion. Provided with either an incontinence or microclimatic cover, the Jay Easy come with the usual high quality features you'd expect from Jay, including a sacral notch, and a bevelled rear (making it easy to pass between backrest posts). Suitable perhaps for users with a moderate to high risk of skin breakdown and shear, the Jay Easy Fluid also has a built-in medial and lateral thigh support to promote optimal thigh positioning. A choice of flat or bevelled bases for solid base or sling seats are also available.